Haunting probably best describes The Polar Express, the performance capture film based on Chris Van Allsberg’s classic children’s book. Critics howled about the creepy computer animation when it was released in 2004, and technological advancements seem to have only reinforced that view. I too spent a good half hour bemoaning the fact that the characters looked like they had just stepped out from a disturbing nightmare, their faces blotched and taut, every movement mechanical yet beckoning a shade of reality. There’s something deeply unsettling about the vacancy in their eyes, the feeling that they’re not quite looking at you but can still see you, completely. Haunted, however, is also how I felt after letting go of my initial repulsion and allowing myself to be swept along this fantastical journey. You won’t find another Christmas film like it. 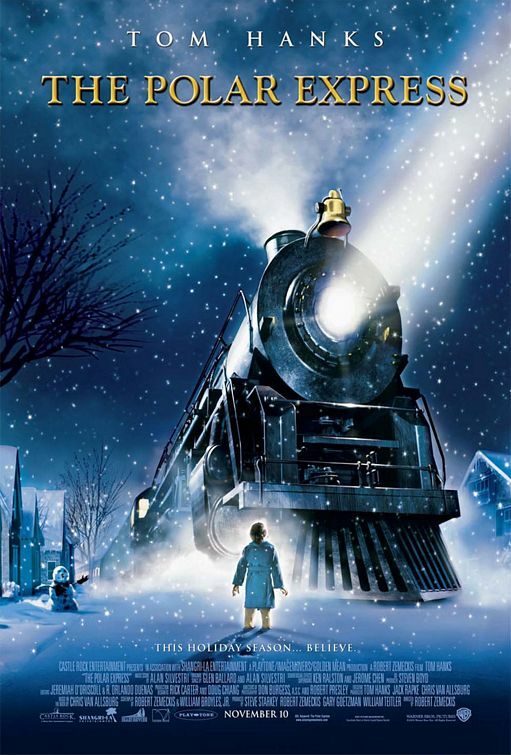 Nearly every scene takes place at night under the vast dome of a Prussian blue sky as the Polar Express, a magical train that takes unbelieving children to the North Pole, rumbles through the barren tundra. Most holiday movies try to seduce audiences with festive bursts of clang and clamor, but this one is characterized by a remarkable stillness. To be sure, action erupts throughout but more often in short, frenzied bursts. A parade of singing, dancing waiters somersaults into the car with steaming mugs of hot chocolate for the children. The nameless main character, trying to return a lost ticket to his fellow passenger, ends up atop the train and is nearly flattened as they hurtle towards a tunnel. Then a loose pin causes the lumbering locomotive to lurch from its tracks and slide uncontrollably across a frozen lake, sheets of ice giving way underneath. But when the flurry subsides, what remains is space, great visual, aural swaths of it. The movie is unafraid of quiet and emptiness, knowing that it gives room for wonder and imagination. This is a story that lets you breathe, that provides landscapes to be explored and filled in. The North Pole is simultaneously rich with detail but uncluttered. It elicits a grand turn-of-the-century train station and city center without laying down a blueprint for every square inch. After they arrive, the three main children get separated from the others and disappear into a cavernous underground. As they try to make their way out, you never quite know what the shadows hide. Even where the frames are rich with detail, much is left unsaid, untouched. One of the eeriest scenes takes place in a train car full of abandoned toys. The boy and girl creep silently by, eyeing them with a suspicion that the toys seem to return. There’s a darkness, even a menace that would be out of place in almost every other Christmas movie but that is perfectly suited for this one, a film both about and for those who want to be vulnerable to a certain Christmas magic. The boy is ready to close the door on Santa, but he, like many of us, wants to believe, happily giving into the pure, childish joy of Christmas if he could be convinced it wasn’t a con. That hope is what makes us speechless with wonder, what allows us to marvel at towering trees and twinkling lights and falling snow. It’s also what compels the boy to board the train under the cover of night and what moves us to sneak silently on to that journey. Writer: Robert Zemeckis, William Broyles, Jr.
Posted in USA, Western movie reviews and tagged animated movies, Christmas movies, family films, Tom Hanks on November 17, 2016 by limmer13. Hallmark operates in a world where annual pumpkin pie contests and harvest festivals take on outsized importance, which is why this film channels a Hatfields and McCoys level rivalry for a story about warring bakers. After best friends and pie goddesses Faye (Michele Scarabelli) and Lydia (Jennifer-Juniper Angeli) fall out over the opening of a new bakery and the use of premade cookie dough, they spend the next decade trying to one up each other in the annual pumpkin pie contest. A win isn’t just a matter of pride though. It also means a financial boost for the respective bakery, and this year, Faye needs one more than ever. But an injury takes her out of the competition and she calls on her daughter to fill her shoes. There’s a small problem, however; Casey (Julie Gonzalo) can’t tell the difference between baking powder and baking soda. If she wants to make it past the first round, she’ll need a lot of help. Luckily this story also throws in a little bit of Romeo and Juliet, and Lydia’s son, Sam (Eric Aragon), does know his way around a kitchen. In fact, he went to culinary school and aspires to own his own restaurant. With Faye out of the competition, Lydia gives her spot to him, unaware of where his feelings might lead. It doesn’t take long before Sam and Casey are sneaking around like teenagers and mixing batter late into the night. In return, she puts her Wharton degree, a qualification she manages to work into every conversation, to good use and draws up a business plan for his proposed restaurant. 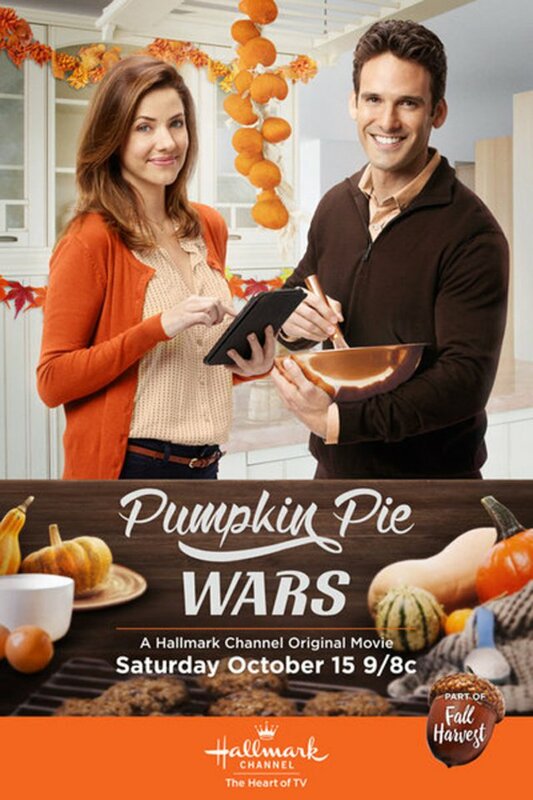 Unlike the creative recipes in the movie, Pumpkin Pie Wars doesn’t endeavor to try anything new. It’s your average frozen pie, slightly sweet and serviceable but lacking in imagination and flavor. Let’s face it; a baking competition is not high stakes when it comes to stories about warring families and forbidden love. Gonzalo and Aragon are nice to look at and have good chemistry, but Casey and Sam don’t have a fiery romance that will set your heart alight. There’s something routine in Faye and Lydia’s sniping as well as their disagreements over their children’s careers. You could just as well watch some church ladies going at it, and that would probably be more exciting. No one turns to the Hallmark Channel for award-winning storytelling though, and if you just want to see lovely people wearing warm-colored cardigans and crisp fall leaves fluttering strategically into place, then you’ve found the right movie. I will also give a rare golf clap to Hallmark for featuring Argentine-born Gonzalo in a lead role, though they may not have known it at the time. For once, we have a Latina and a bank of non-white extras showing us the holiday spirit. I will raise my pumpkin spiced drink to that. Posted in USA, Western TV reviews and tagged Hallmark Channel, romance, TV movie on November 16, 2016 by limmer13. 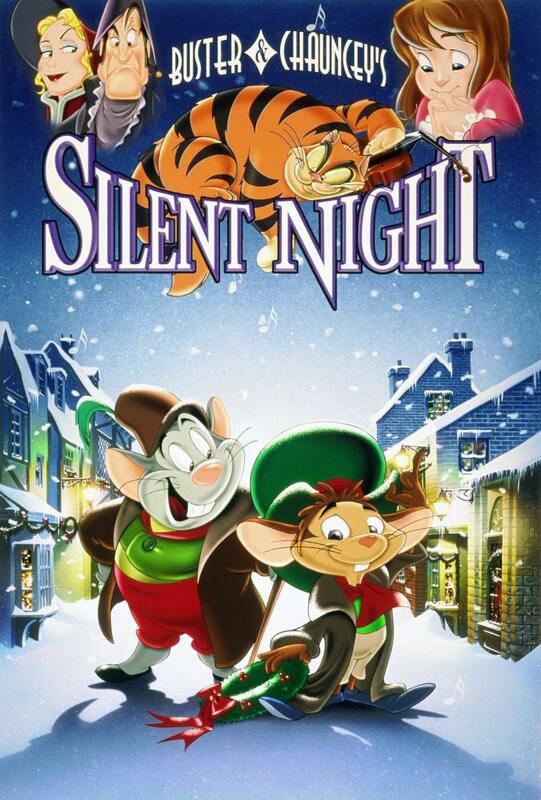 Buster and Chauncey’s Silent Night deserves to be a better movie than it is. Despite a talented voice cast that includes Phil Hartman, Jim Cummings, and a young Lea Michele and a couple songs from the songwriting team that gave us Anastasia and Broadway’s Ragtime, this Christmas film suffers from uninspired animation and writing. Still, this tale about the first performance of “Silent Night” works some holiday magic, and if your heart is big enough, you may want to add it to your Christmas queue. The rest is reliably fairy tale. The two mice are an odd couple; Buster has ambition to match his waistline while the meeker Chauncey is happy just fiddling on his violin and curling up in a warm mouse hole. Chauncey shows his Christmas, and Christian, spirit when he befriends an orphan, Christina (Michele), and tries to save her from two thieves intent on robbing the church during a welcome celebration for the queen. The harsh and unforgiving Mayor Huffenmeier inadvertently makes life hard for everyone though, and his fat cat wants to make a meal out of the little mice. Though the film is a direct-to-video effort, I’d hoped for something more than a bonus episode of a Saturday morning cartoon. The warmth of an old Austrian Christmas coupled with a feel-good message of generosity and humility is prime material for a animated family film starring anthropomorphic mice, but nothing builds on this basic framework. Buster and Chauncey’s relationship with Christina is fleeting though the climax turns on their supposedly close friendship. The mice are more believable buddies, but even here they are generic rodents, possible escapees from the set of Cinderella. I was most disappointed with the animation, however. Aside from some lederhosen and Tyrolean hats, it’s hard to tell the story takes place in Austria. I wanted to be swept away by the wintery mountain landscape and walk between the cozy wooden houses. Chauncey’s big, unselfish heart, makes up for some of the film’s shortcomings; we could all use some of that this time of year. Posted in USA, Western movie reviews and tagged animated movie review, Christmas movies, family films, Jim Cummings, Lea Michele, Phil Hartman on November 15, 2016 by limmer13.